Domains and covalent modification sites of STAT proteins. The STAT protein (Signal Transducer and Activator of Transcription, or Signal Transduction And transcription) regulates many aspects of growth, survival and differentiation in cells. The transcription factors of this family are activated by Janus kinase (or 'Just Another Kinase', JAK) and dysregulation of this pathway is frequently observed in primary tumours and leads to increased angiogenesis, enhanced survival of tumours and immunosuppression. Gene knockout studies have provided evidence that STAT proteins are involved in the development and function of the immune system and play a role in maintaining immune tolerance and tumour surveillance. 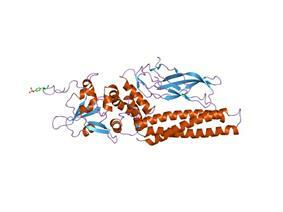 The first two STAT proteins were identified in the interferon system. There are seven mammalian STAT family members that have been identified: STAT1, STAT2, STAT3, STAT4, STAT5 (STAT5A and STAT5B), and STAT6. STAT1 homodimers are involved in type II interferon signalling, and bind to the GAS (Interferon-Gamma Activated Sequence) promoter to induce expression of ISG (Interferon Stimulated Genes). 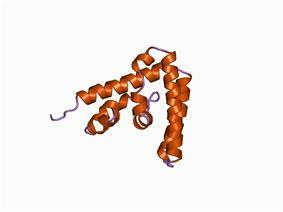 In type I interferon signaling, STAT1-STAT2 heterodimer combines with IRF9 (Interferon Response Factor) to form ISGF3 (Interferon Stimulated Gene Factor), which binds to the ISRE (Interferon-Stimulated Response Element) promoter to induce ISG expression. STAT proteins were originally described as latent cytoplasmic transcription factors that require phosphorylation for nuclear retention. The unphosphorylated STAT proteins shuttle between cytosol and the nucleus waiting for its activation signal. Once the activated transcription factor reaches the nucleus, it binds to consensus DNA-recognition motif called gamma-activated sites (GAS) in the promoter region of cytokine-inducible genes and activates transcription of these genes. Extracellular binding of cytokines induces activation of the intracellular Janus kinase that phosphorylates a specific tyrosine residue in the STAT protein that promotes the dimerization of STAT monomers via their SH2 domain. The phosphorylated dimer is then actively transported in the nucleus via importin a/b and RanGDP complex. Once inside the nucleus, the active STAT dimer binds to cytokine-inducible promoter regions of genes containing gamma-activated site (GAS) motif and activates transcription of these genes. The STAT protein can be dephosphorylated by nuclear phosphatases, which leads to inactivation of STAT and the transcription factor becomes transported out of the nucleus by exportin crm1/RanGTP. ^ Vinkemeier U, Moarefi I, Darnell JE, Kuriyan J (February 1998). "Structure of the amino-terminal protein interaction domain of STAT-4". Science 279 (5353): 1048–52.